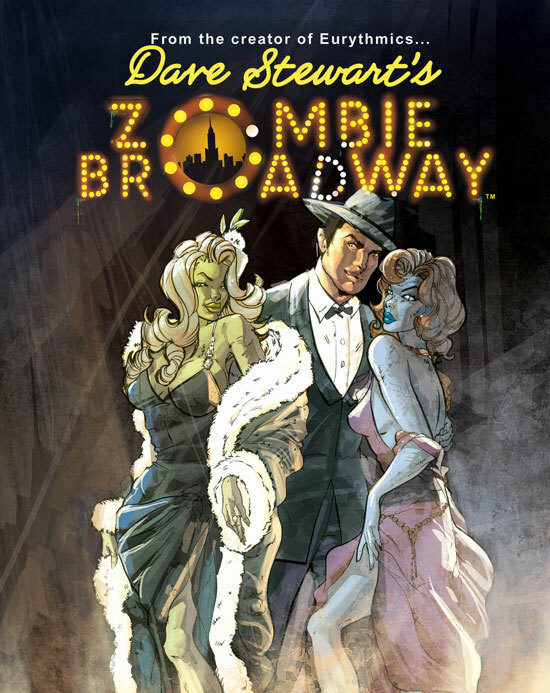 Known for his visionary work in the recording studio and his creative entrepreneurship, Euyrthmics co-founder Dave Stewart is shaking up the world of comics with ZOMBIE BROADWAY, the outrageous horror-comedy-musical graphic novel. New Yorkers. After all, they appreciate the theater. In fact, music seems to be one of the few things that can tame the flesh-eating undead beings. And what better place than New York City to put on the show of a lifetime? Just keep your fingers crossed that the audience isn’t eaten during the performance… Created by David Stewart, David Harris, Christine Schenley, and illustrated by Daveki Neogi.